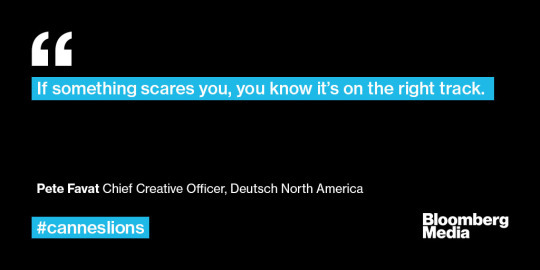 In Part 2 of a series in conjunction with the 64th Cannes Lions International Festival of Creativity, Bloomberg Media Global Chief Creative Officer Teddy Lynn explores how to identify and cultivate great creative work with Pete Favat, Chief Creative Officer, Deutsch North America, and President, 2017 Cannes Lions Film Jury. Teddy Lynn: Pete, you were the first Chief Creative I worked for many years ago, and were a deeply valuable mentor to me. Thanks for doing this. Let’s talk about great work. The process of going from a germ of idea to amazing famous award winning work is complex and arduous. It takes both art and science and so my aim is to briefly try and shine a light on how the best approach it. You’re obviously a master judge. I’m a relative novice. When I’m judging or looking at great work, I have these three filters that I use: 1. Does it change my feelings about the brand that made it? 2. Do I want to experience it again? 3. Do I wish I had made it? Pete, what makes great work great in your eyes? Are there both emotional and rational components? Pete Favat: Yeah, your three filters are pretty damn good. It’s funny because I’ve tried so many different ways to stimulate people to create great work. 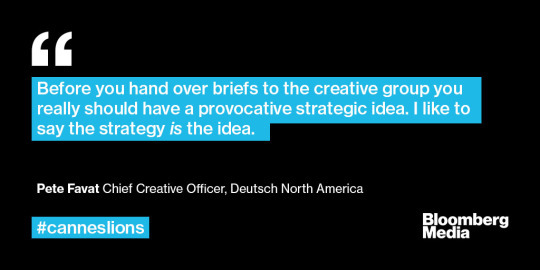 My real belief is that the strategy is a big part of the idea and that before you hand over briefs to the creative group you really should have a provocative strategic idea. I like to say the strategy is the idea. Part of that provocative idea needs some sort of tension. A great novel, a great song, a great movie, or a great piece of advertising needs to have some sort of tension in it. It needs an antagonist and a protagonist to get me to engage. Imagine Jaws without the shark. It would be some crappy summer movie about Martha’s Vineyard and a family that moved up there from New York. No one would want to watch it. You can basically put up any famous piece of creative and you can easily back out the tension strategy. What were they pushing against to create it? In 1984 the antagonist was IBM. For Nike and “Just Do It” it’s complacency or just being lazy. Great work needs to communicate the rational, but the tension is how we get people to feel something— to opt in. TL: What about back at the agency, before work is ever sold, let alone made? You look at an awful lot of work when it’s three days old. Sometimes it’s from kids, sometimes it’s from people that have been doing this 20 years. I bet, more often than not, the thing you’re drawn to isn’t the obvious thing. How do you know when you’re seeing the early stages of a good idea? PF: I think part of being a creative director is that you have to have somewhere in your gut, that little bell that goes off and says there’s something to that. I don’t know how you get it or how you hone it or how you get more of it, but it’s something that just happens. You know deep down that it’s going to strike a chord in a lot of people. I think most times, too, it’s an idea that scares you. If something scares you, you know it’s on the right track because it’s going to make people pay attention. TL: How do you approach selling ideas to clients? Is there a right number or format? PF: The simple answer is trust. A client, if they’re going to take a chance on a risky idea, must trust you. Empathizing with clients is also important. It’s understanding that a lot is at stake for them. My colleague Winston Binch and I gave a talk at the Ad Club two years ago and they wanted us to talk about how we’ve been brave in our career. But the brave ones are actually the clients. It’s their money. If a brave idea, a bold idea doesn’t work for them, they could lose their job. TL: Do you always present the range, or do you ever just go with one idea? PF: No, I like presenting a range. 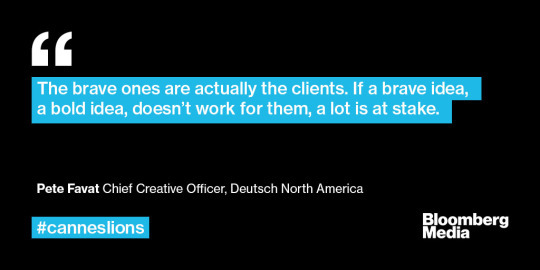 It really, really depends on how well you know the client. Do you have a good feel for what they’re going to go for or not? Typically, I think more than three ideas in a presentation is crazy. It shows that you’ve got no conviction. If you show too many, it’s like, “Which one do you like?” Two to three is enough. I think showing one is a little disrespectful. TL: I don’t disagree, yet some of my best work, some work you’ll be judging this year, I just said, “You know what you should do? You should do this,” and I showed only one idea and the clients said OK.
PF: You had people who trusted you, dude. TL: I hadn’t thought about it like that, but maybe you are right. Let’s talk collaboration for a minute. As you know, having worked with me, I’ve always liked to go to people outside the agency world to work with on projects, and I think that’s becoming more and more commonplace now. The “everything must be made here” agency style is, I think is changing. Do you agree with that? PF: Absolutely. 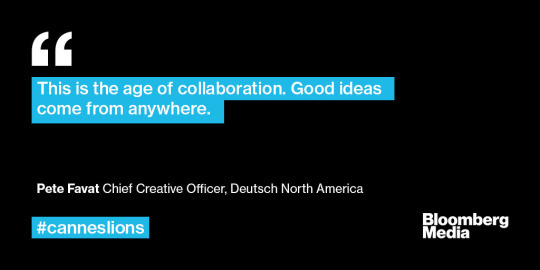 I think that this is the age of collaboration. The age of arrogant directors and creative people is over. I don’t think any one single person has an answer. Good ideas come from anywhere. At Deutsch we start the creative process with a really diverse group of people around the table, no matter what the assignment is. In addition to creatives we’ll have engineers, product designers, producers, designers and PR people. I’ll even freelance comedians and people that don’t know anything about advertising. I think what happens then is that an engineer who’s never done a TV campaign might have a great idea for one simply because he’s never done one. It’s all about something fresh, the unexpected. Sometimes it fails miserably, but sometimes you come up with work that you never would have dreamed of. It’s kind of funny because a lot of the work we’ve done that has been winning at Cannes came out of the heads of engineers. PF: Not really. I just finished judging The ANDYs and saw lots of good work but this year is a little bit of a crap shoot. That’s kind of fun, actually. I’m not going in with anything in my head.